Tamura has been around for a long time (or so I was told by various people who recommended it to me), and in various locations. There is one in Green Park Extension, and one in New Friends Colony Community Centre—and one, opened recently, at Jasola, which is pretty much opposite where we live. We’d eaten at the Tamura in Green Park Extension and been underwhelmed enough (the food was all right, nowhere as superlative as I’d been led to believe) to not particularly wish to return. But when I got an attack of acute tendonitis, and couldn’t cook, we had to resort to ordering in—and, tired of the same old pizzas and South Indian stuff, decided we may as well order from the Jasola Tamura. Perhaps, we figured, since this was a new restaurant, they’d be doing a better job here than at Green Park. The Tamura menu—or at least their home delivery menu—isn’t vast. There is some sushi, a few staples like yakitori and katsudon, and—thankfully for us, since we’re so fond of them—bento boxes. We, naturally, chose two bento boxes: one, a pork shogayaki, and the other a chicken teriyaki. Both, according to the menu, would come with rice, noodles (both? That surprised me), salted vegetables, salad, vegetables, and the main dish. My husband phoned up Tamura to place the order. 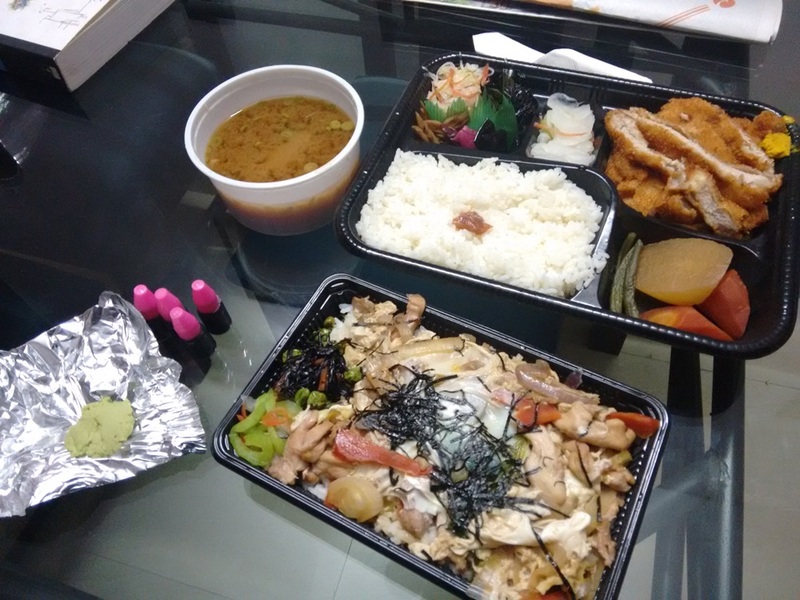 Within half an hour, our meals had arrived, packed in disposable bento boxes, covered with clear plastic lids and with a pair of chopsticks wrapped in a paper napkin along with each box. There was a brief moment of unhappiness: my husband, who loves miso soup and had been expecting it to be part of the bento box—since it had been, when we ate at the Green Park Extension Tamura—was disappointed to find that there was no miso soup with the bento boxes delivered. The delivery man informed us that miso soup would cost Rs 100 extra per serving, but since I was hungry and didn’t want to wait any longer for the man to go back to the restaurant and fetch miso soup, we decided to give it a miss. And then it was time to open the boxes. The chopsticks proved to be terrible quality, splintering even as we broke them apart, so that we had to raid our cutlery drawer for our own chopsticks. Also, we made the surprising (not in a good way) discovery that none of the condiments we take for granted with Japanese takeaway—wasabi, soya sauce, gari (pickled ginger)—were part of the box. Gari we didn’t have at home, but we pulled out wasabi from our fridge and soya sauce from the kitchen, and sat down to eat. I’m guessing this is stuff that’s more usually eaten with sushi, but my husband, for one, cannot imagine having a bento box without at least wasabi and soya sauce. 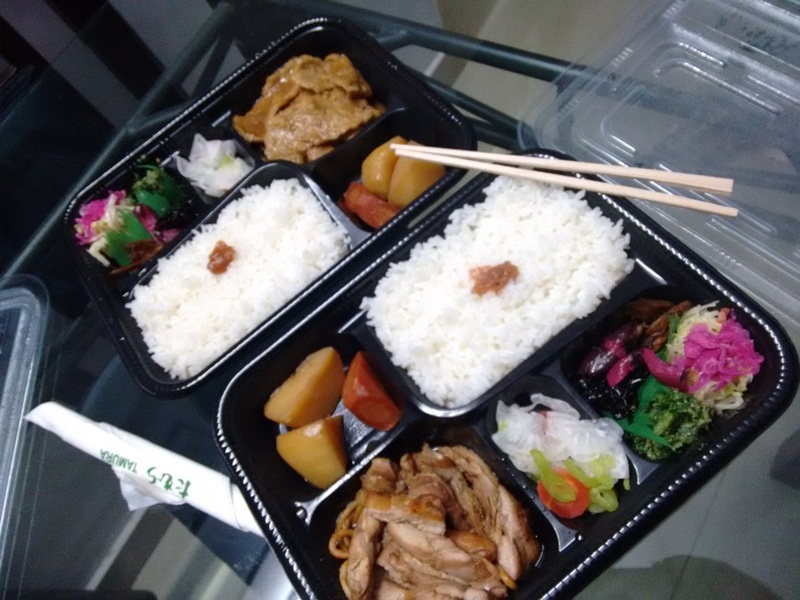 Bento boxes from Tamura – pork shogayaki and chicken teriyaki. Rice. Pretty basic, of course, and neither good nor bad. This was a very generous portion, which came with a little blob of something tart and dirty pink in colour—we couldn’t figure out what, but it was an interesting little palate cleanser. Vegetables. Cooked potato (two large wedges) and cooked carrot (one large wedge). Again, pretty standard, and quite nice. Salad. Very thinly sliced daikon, peeled cucumber, and carrot. The daikon and carrot retained that crisp freshness, but the cucumber had gone limp—I’m not sure if that was intended, or it had just been sitting about too long. Salted vegetables. This was where it got interesting. Tucked away in one compartment were four types of pickled vegetables: a little heap of pickled white cabbage, topped off with a garnish of pickled red cabbage (the red was more tart than the white—I preferred the white); spinach (which tasted like a spinach gomae—mixed with a paste of white sesame seeds and seasonings); thinly sliced, crisp-fried lotus stems; and pickled nori (or some other seaweed? Seaweed, at any rate, and briny enough to really remind one of the sea). The salted vegetables were, on the whole, not too nice: the seaweed was too salty for my liking (and the salt—in the form of soya sauce—had seeped into the lotus stem chips, softening them slightly, but worse, making them too salty as well. The spinach was so-so (if it was gomae, I’ve had better), and the cabbage, while all right, wasn’t blow-your-socks-off good. Worst of all, there was a little strip of thin green plastic, laid like a little partition between the spinach-and-cabbage on one side, and the seaweed and lotus stem on the other. I suppose it was supposed to keep them separate, but that didn’t really work. And I am staunchly against strips of plastic adhering to my food. It didn’t look food grade to me. Chicken teriyaki. This was the main I’d ordered, and it was decent enough: generously cut strips of chicken, glazed with a sweet-salty-sour teriyaki sauce. The sauce was good (if a little too salty—I must admit, though, that my threshold for salt is a little low, so maybe that’s just me), the chicken juicy and cooked just right. 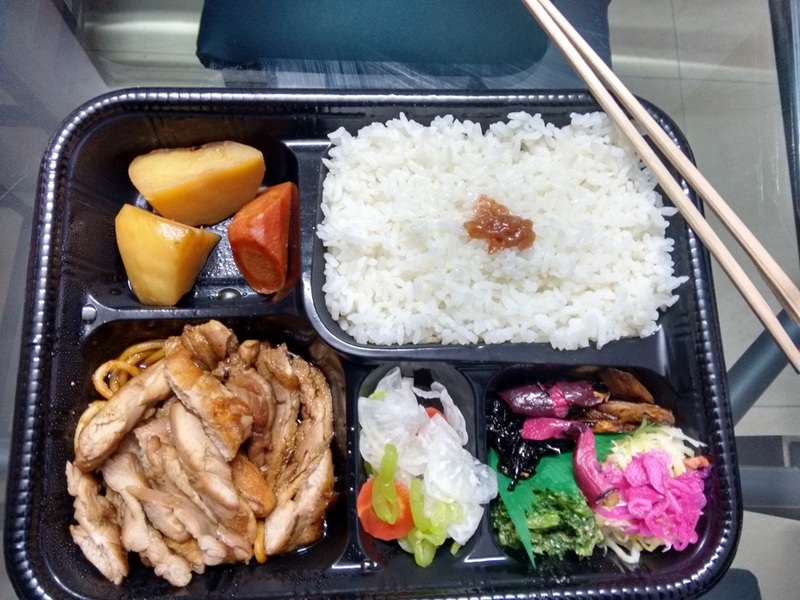 The chicken teriyaki bento box from Tamura. Pork shogayaki. This was the main in my husband’s bento box, and he shared half with me while I shared half of my chicken teriyaki with him. The shogayaki sauce—a sweet-sour ginger sauce—was good, but the pork was just not right. It was too dry and chewy, probably a combination of factors: meat that was too lean, sliced too thin, not very good quality to start off with. In any event, both of us agreed that the chicken was definitely better than the pork. Such a shame, really, considering pork shogayaki can be all sorts of awesomeness (which makes me mourn the sad demise of what used to be my favourite Japanese restaurant in Delhi, Izakaya: Izakaya’s pork shogayaki was to kill for). 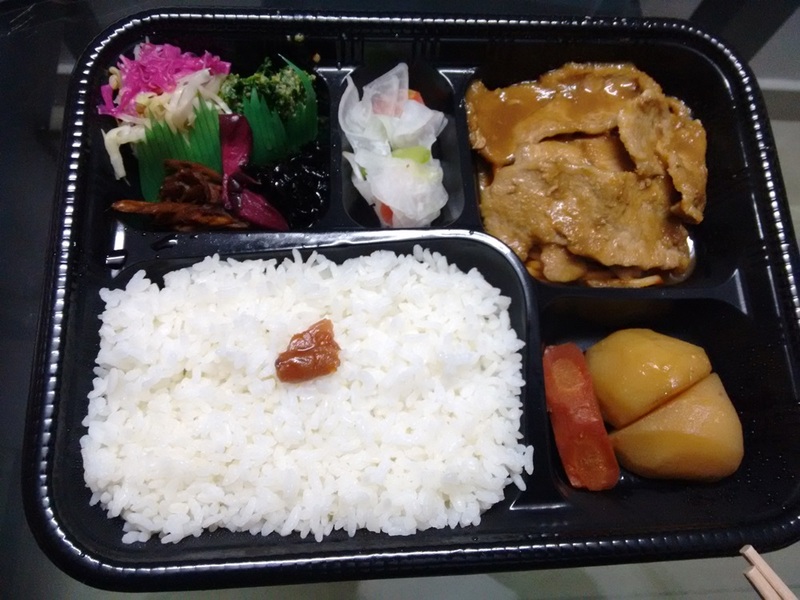 The pork shogayaki bento box from Tamura. Noodles. I didn’t see the point of the thick noodles, lightly covered in sauce, which formed a bed for the chicken and the pork. After all, if there was rice, there wasn’t really any need for the noodles, was there? Especially as it wasn’t as if there was a whacking great heap of noodles, either; there were only about six strands or so of the stuff. All in all, this was a meal that might’ve appealed to someone who was looking to fill their tummies—it was a large, filling meal. If you wanted more than to simply be full, it fell short. My main problem with the food was that it lacked the freshness I tend to associate with Japanese food: everything just seemed so tired and limp (yes, I know the fact that this was takeaway probably contributed to it—not too many meals are able to withstand transportation; but I have to admit that the one meal I’ve had at the Tamura in Green Park Extension was pretty much like this too). We paid Rs 987 for our meal, which might be considered a bit of a saving grace, since (by Delhi standards) it’s not terribly expensive. But for Rs 987, I’d have expected more tasty food. Is that all? Not really, because two days later, since my tennis elbow was still troubling me, we ended up ordering once again from Tamura. Call us gluttons for punishment, or merely ready to give people a second (or should that count as third?) chance, but order we did. This time we’d thought we’d order sushi, but since it turned out they actually have only one sushi dish on the menu, we ordered another bento box (a tonkatsu), and an oyakodon. My husband, since he now knew not to take it for granted that condiments would be supplied, asked specifically for wasabi, soya sauce, and gari—and also ordered a miso soup with the bento box. The chopsticks were as splintery as before, but at least they’d remembered to send the soya sauce (in tiny plastic vials) and the wasabi (a lump of it, wrapped in aluminium foil). They’d forgotten the gari. The bento box was similar to before, but with a few minor changes. Along with the potato and carrot, there were three lengths of green beans. And among the salted vegetables, there wasn’t any spinach, but there were some green beans. Also, the vegetables were rather better than the previous occasion: not quite so salty, and much more flavoursome. The tonkatsu—pork cutlet—had been breaded and deep fried to a lovely crisp golden exterior, then cut into strips and heaped on top of the predictable noodles, along with a dollop on the side of a good, pungent mustard. As tonkatsu goes, this wasn’t the worst I’ve had, but it wasn’t the best, either. The pork was a little too dry, but at least it wasn’t chewy; and the crumby crispness of the outside was great. The oyakodon was something I’d been looking forward to, mainly because I have good memories of a particularly toothsome oyakodon at Sakae Sushi. Chicken cooked with onions in a delicious sauce, served on a bed of rice, with an egg broken over the top and allowed to cook in the steam from the rice, the whole of it garnished with chopped spring onions, strips of seaweed, and other goodies. At first glance, Tamura’s oyakodon—in a rectangular plastic box—looked like a cross between oyakodon the way I know it, and Tamura’s own bento box. There was the rice, covered with the yellow and white of the cooked egg. There were the strips of chicken and onion. There was, as garnish, a generous handful of thin, black seaweed. On the side, tucked into the right side of the box, were the salted vegetables that are part of Tamura’s bento box: peas (sadly shriveled); julienned carrots, and seaweed. There was even a helping of salad—thinly sliced daikon, peeled and seeded cucumbers, carrot—tucked in (not a good idea, this, since the heat of the oyakodon had made the salad completely limp). A tonkatsu bento box and an oyakodon. Texture-wise, the chicken was good: juicy and well-cooked (I’ve come to the conclusion that Tamura know how to cook chicken; pork, no). The vegetables were overdone, and the seasoning in the dish was far too low. All that lovely umaminess wasted, all for the lack of salt. I added some soya sauce and wasabi to perk it up, but really: this should not’ve been necessary. Anyway, the conclusion we’ve come to is that Tamura is really not worth ordering from. I can’t see why it seems to have so many adherents (people, actually, who’ve called it the best Japanese restaurant in DelhI! ), and I, personally, can think of far better places if I’m in the mood for Japanese food. Even if I want to order in. Japanese cuisine is alien territory for me, excepting Chicken Teriyaki. We had some delicious Teriyaki some time back and I am not too sure I would ever try sushi which is why I never enter a Japanese only restaurant. I guess Japanese cuisine and I are not made for each other. BTW hope you are fine now. Till a few years ago, I was very wary of trying sushi either – the only Japanese food I’d had was teriyaki, sukiyaki, and yakitori. Then one fine day, Tarun and I were walking through a mall and came upon this restaurant called Izakaya – and decided, on a whim, to take the plunge. We ordered sushi (though some of the sushi we ordered wasn’t with raw fish), and ended up liking it so much, we’ve become firm fans. I don’t suppose either of us will be able to summon up the courage to have stuff like octopus, but some of the more usual (for Japanese restaurants in India) dishes are among our favourites. So sushi is available without raw fish, oh! good, then maybe I will give it a try. I was thinking of making do with veg sushi. I’ve had some very good sushi with cooked prawn in it. One particularly nice one has pieces of prawn tempura rolled into the rice. Very good if you’re not keen on raw fish (though good sushi restaurants will make sure that the fish is really fresh, so even if it’s raw, it doesn’t taste – or smell – ‘fishy’. A cousin who designs restaurants for a living (and is um, not averse to try out the finished products) tells me all the Sushi sold in India is made with poached fish. Something to do with the law, it seems. In any case, Sushi is mostly about stuff rolled in sticky rice and seaweed sheet, raw fish is not essential. Sashimi’s more strictly about raw fish. poached fish? Wow. That’s interesting. I never knew that. And yes, I agree – sashimi is more strictly about raw fish. Actually, sushi, what with its Americanization, has now all sorts of not-too-typically Japanese ingredients (Philadelphia cream cheese, for instance, or avocado) added to it. BTW, am I on WhatsApp! I don’t know if you’re on WhatsApp or not. I’m not. The blob is umeboshi (a pickled plum which is sour and -at least to me- very pleasant in rice or onigiri. Ah! Thank you so much. I’ve heard of umeboshi plums, but had no idea this was one. Since I wrote this review, I’ve eaten from Tamura several times (we discovered their yakitori is very good, and comes with an especially delicious side of fried tofu) and I’ve developed a liking for the tang of the umeboshi plum.